I've come to the conclusion that I'm not really addicted to eggnog per se, but rather it must be the spices within. I'm equally enamored with things like Snickerdoodles and Cinnamon Fudge and so it must be those spices that grab me. Since the addicting Cinnamon Fudge made a welcome appearance in my life last season, I've been dreaming up another version of fudge that would be equally appealing. 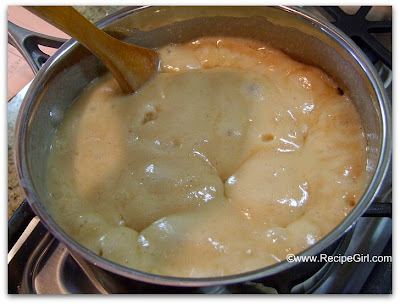 I did a little search for eggnog fudge and found one on Recipezaar... there were mixed reviews. Commenters seemed to agree that the fudge was quite sweet and turned out a firmer-than-normal fudge. So I took that recipe and played with it a little bit to create a bark with added pretzels. 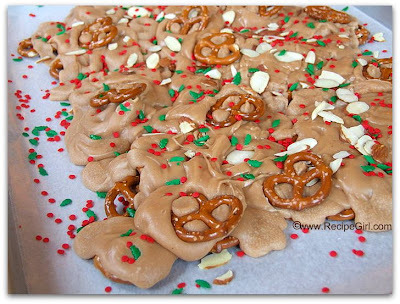 I figured that would cut down on the sweetness with its salty addition: Fudgy Eggnog Pretzel Bark. 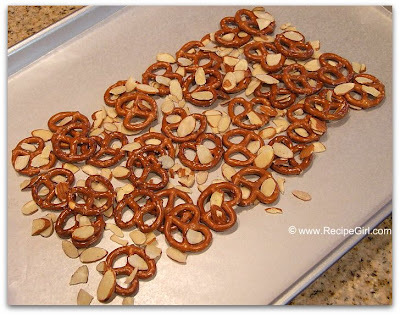 Spread mini pretzels onto a waxed paper-lined baking sheet. Throw some sliced almonds on there if you'd like. Add holiday sprinkles too if you're feeling festive. Anything you put on the bottom here will stick to the fudge... so when the whole thing is turned over, that's what you'll see. Then make your fudge! Use a big enough pan so it doesn't bubble up over the top. Plan to stir constantly, and have a timer nearby. No thermometer is needed on this one. You'll need to work quickly since the fudge sets up pretty fast. 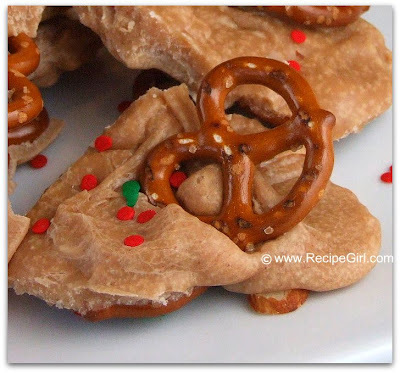 Pour it all over the top of the pretzel mixture. 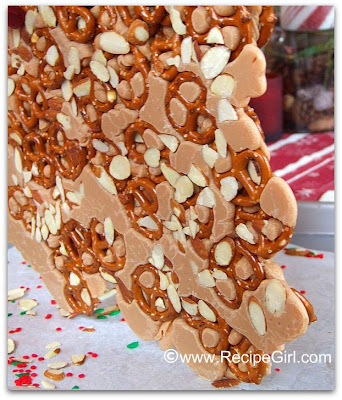 If you have a friend, or if you yourself are speedy, you can add more pretzels and sprinkles to the top. Just gently press them here and there- as quickly as you can. As I said before, it begins to harden almost immediately so you do need to accomplish any additions rather briskly. If you don't manage to get anything on top, don't worry... when you turn the whole thing over, you'll have the decor on the other side. Let cool to room temperature, then break it up into pieces and munch away. I've really tried to be quite good this season and just take a little test-sample of each treat I've made. But I shouldn't have tested this one at all because I found that it was tough to stop sampling. Did it taste like eggnog? Not really. You can definitely taste the spices, and since I'm a huge fan of eggnog I could detect that flavor as well... but it's not a huge eggnog flavored treat. In fact, you probably would enjoy it even if you disliked eggnog entirely. 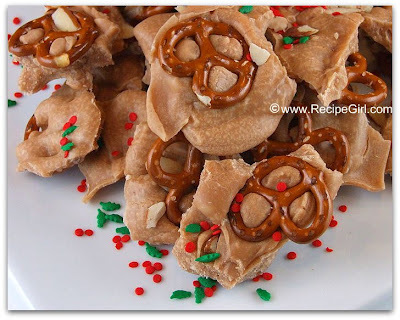 I considered adding vanilla oreos to the mix to make it a cookie- pretzel bark (much like the wonderful Candy Corn Cookie Bark I made), but I feared that would make it a little bit too over-the-top sweet. Try it if you dare! I'd say this experimental treat was a large success. I pawned it off on the ladies in the school office, packaged it up and gave some to my son's teacher, and even slipped a few pieces to the Mom's at basketball practice too. Thankfully (for my diet), it's already gone. Many more holiday treats can be found in recent posts.